When I knew that I wanted to make a stuffed sweet potato recipe, I was looking at a variety of recipes and there was one thing missing over and over – the protein! Sweet potatoes are such a healthy food – fiber, vitamin A (that’s the orange color), vitamin C, b-vitamins – they’re flavorful, nutritious and versatile. Kale sautéed in coconut and lime is just: delicious and a nice way to enjoy this dark leafy green if it’s a bit too intense raw in a salad. 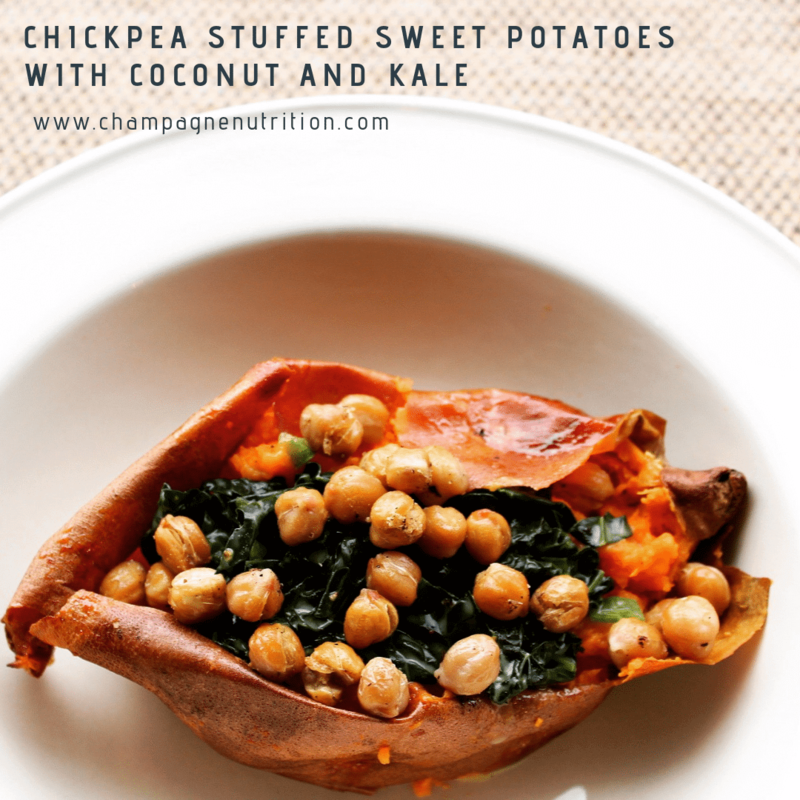 My magic ingredient in Chickpea Stuffed Sweet Potatoes with Coconut and Kale is definitely the chickpeas. I almost always use canned because it’s so much faster. Just drain them, roast them and use them. They’re so hands-off and a quick, easy protein source you can use in many ways – even just as a snack. 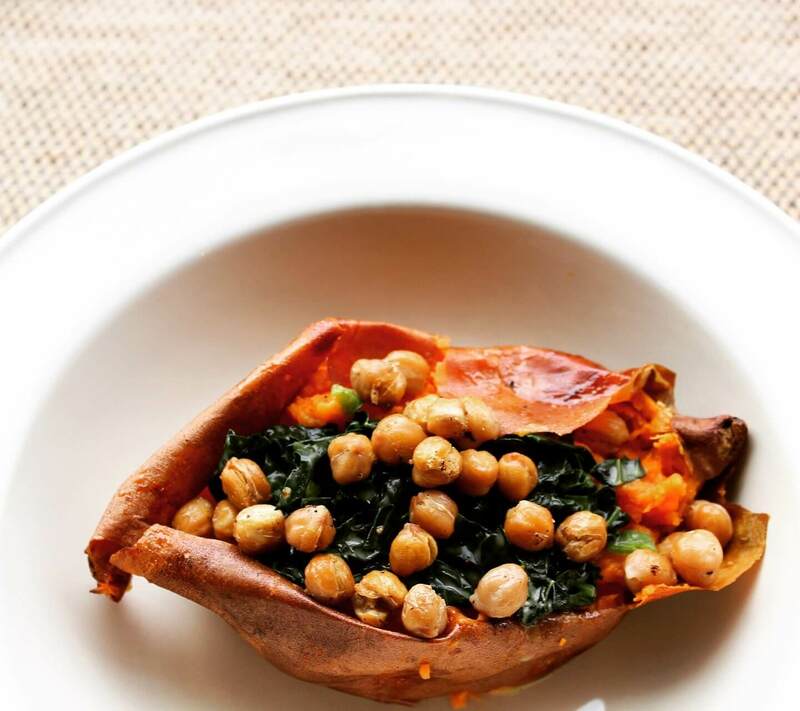 I hope you enjoy this Chickpea Stuffed Sweet Potatoes with Coconut and Kale recipe when you make it – let me know how it turns out. If you need some more plant-based recipes, try my No Noodle Vegetarian Eggplant Lasagna with Quinoa and Spinach or my super simple Healthy Vegetarian Sheet Pan Nachos! Preheat oven to 400°F. Rub potatoes with 1 Tablespoon olive oil; pierce liberally with a fork then bake for 1 hour or until tender. Set aside to cool. Split potatoes in half lengthwise gently.